In this two-day workshop you will learn how to make "direct positive" 4x5 tintypes from start to finish—there are no negatives or enlargements in this process. We will work using a DIY "in the field" dark room small enough to fit into the back of a car, and discuss strategies for building your own mobile collodion darkroom and equipment. You will learn the chemistry and techniques to pour, expose, develop and varnish your plates. You will have time to create 2-3 of your own tintypes using antique, large format view cameras. You will also receive recipes, information and resources to help further your wet-plate exploration. This class emphasizes shooting in natural daylight, although studio lights are also available. After completing this course, you will have the foundation of skills, experience and information to continue the Wet-Plate process on your own. I am a multi-disciplinary artist working in photography, printmaking and sculpture. I was introduced to Wet-Plate Collodion in 2010 during a workshop with Joni Sternbach without having any prior photography experience. I fell in love with the process and immediately started to build the equipment I needed to take tintypes in the field. Within 4 months of the workshop I was traveling across the U.S. with a dark-box in the back of my car, taking portraits of people living off-the-grid for a project titled “Homeland”. Since 2010 my collodion work has been featured on NPR and published in various international publications including Style and the Family Tunes (Berlin), La Mono (Spain), Little White Lies (London). In 2012 I had two solo exhibitions featuring collodion work, one at Kesting/Ray in SoHo, and another at Weldon Arts in Brooklyn. I have been a resident at the McColl Center for Visual Arts, The Camera Club of New York and The Bronx Museum for the Arts. In 2011 I began teaching the Wet-Plate process. I have taught over 50 artists and photographers in the past year. 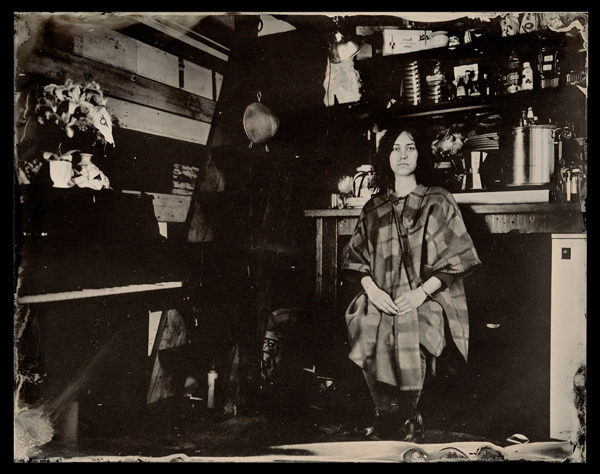 Currently I teach introductory tintype courses at 3rd Ward (Brooklyn), Pioneer Works (Brooklyn) and in my studio. I have also lectured at Warren Wilson College and The College of New Jersey, have run workshops with The A.W. Dreyfoos School of the Arts and The Philadelphia Mural Arts Program, and have been faculty at Parsons The New School for Design. Tora at Cold Castle, New York, NY. 8x10 Tintype by Robyn Hasty. 2013.